The US market for circuit breakers and fuses is forecast to increase 4.3 percent per annum to $5.3 billion in 2020. Sales expansion will be bolstered by ongoing efforts to expand and upgrade the US electrical grid, as well as by a return to growth in electricity generation levels following the modest downturn experienced during the 2010-2015 period. 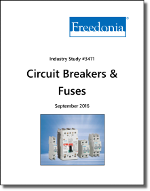 This study analyzes the US markets for and manufacturers’ shipments of circuit breakers and fuses. The specific products covered are molded case (industrial, light-duty, and specialty) and power-type circuit breakers, and related parts and accessories; and high-power (including distribution cutouts), cartridge, plug, electronic, and other fuses, as well as related parts and accessories. Companies mentioned include Eaton, General Electric, Schneider Electric, ABB, Littelfuse, Siemens, Mersen, and TE Connectivity.